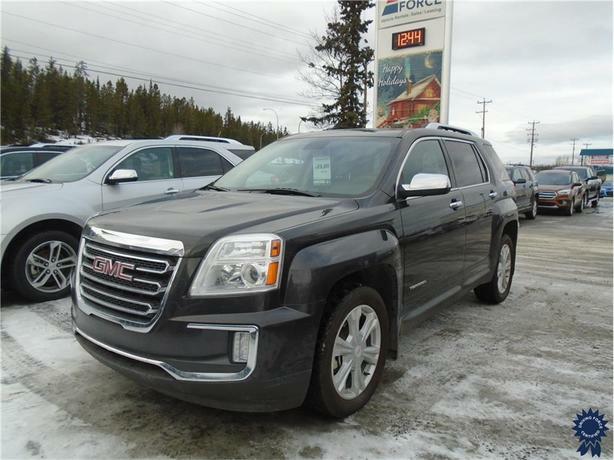 This 2016 GMC Terrain 5 Passenger All Wheel Drive SUV comes with a 6-speed automatic transmission, 3.52 final drive ratio, 18-inch wheels, leather seats, Color Touch AM/FM stereo, Trailering Equipment Package, engine block heater, 120-amp alternator, spare tire and wheel, chrome roof rack rails, remote keyless entry, remote vehicle starter system, heated mirrors, power door locks, backup camera, WiFi hotspot, and smart device integration. The 2.4-litre DOHC 4-cylinder SIDI gas engine provides 182 horsepower at 6,700 RPM and 172 lb-ft of torque at 4,900 RPM. Touch base with us to discuss purchasing or financing options that are right for you and experience the difference you will only find at DRIVING FORCE Vehicle Rentals, Sales and Leasing.